Take control of the entire Caribbean by becoming the King of the Pirates! 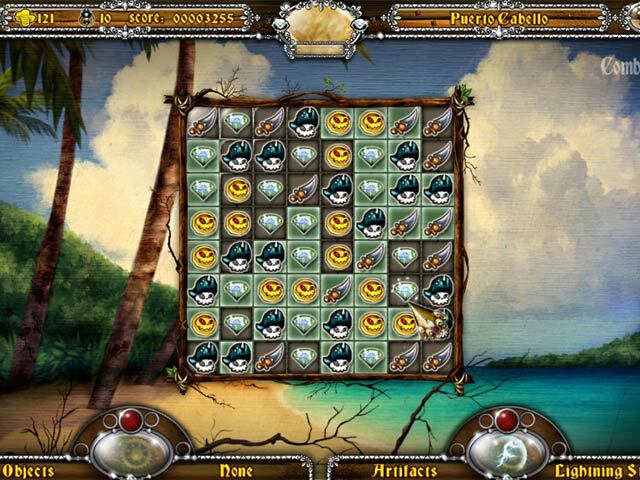 Sail the dangerous seas and battle your way to the top in this gripping Match 3 game. Complete different quests, expand your arsenal, and collect powerful artifacts as you explore the Caribbean islands in multiple gameplay modes. Battle perilous pirates, outrageous octopuses, and sinister squids in Lucky Pirates! Become king of the pirates! 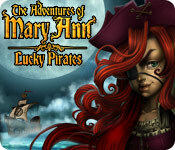 The Adventures of Mary Ann: Lucky Pirates is rated 4.7 out of 5 by 18. Rated 5 out of 5 by chipps611 from An oldie but a goodie Bought this one at least 4 years ago and still find myself going back to it after all this time. One of the better adventure/match 3 games out there, there is a LOT to do, and you won't be bored. Can't give it anything but two thumbs up, wish I could find more like it! Rated 5 out of 5 by verycheekyCherry from Great Fun! I've found this to be a wonderful match 3 game. It's challenging but not impossible. For the most part I am not fond of match 3's because they frustrate me badly. I'm actually enjoying this game immensely. The battle system is great for someone like me. It's straightforward and I don't have to do fantastic combinations to charge up a weapon or score a good hit. I also like the secondary weapons as well as the maps. This is a breath of fresh air from all the rush, crush, drop, pop and jewel genre of match 3's. I hope we get more like this. Rated 5 out of 5 by ileanaf123 from BEST GAME EVER I OWN OVER 35 MATCH 3 GAMES AND THIS ONE IS BY FAR THE BEST. YOU SO MANY DIFFERENT GAMES IN ONE AND ALL EXCITING & FUN. WORTH YOUR MONEY AND THEN SOME. YOU WONT BE SORRY. Rated 5 out of 5 by Luminoire from Match-3 Game with a twist! I love the unique gameplay concepts in this game. The variety of level types keeps the gameplay fresh. Highly recommend this for any match-3 lover! Rated 5 out of 5 by crisgori from The best M3 ever This is a great M3 game : lots of different things to do, nice storyline, challenging, good value in repeating the game. Rated 5 out of 5 by Pauluskam from One of the best game I have already played from Bigfish.... Good story, nice graphics, very challanging but it´s possible to replay levels, no boring at all, with diferent type of match 3 games and others. Rated 5 out of 5 by Aerosage from Mary Ann Takes the Cake Overall, I found the game to be quite entertaining. Likewise, I feel the game was designed to be very user-friendly. I really enjoyed all the different levels of play during the adventure. 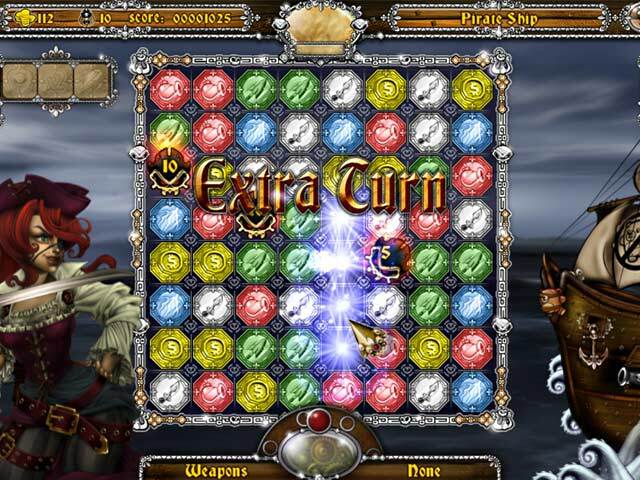 The re-playability of Lucky Pirates is noticeable from the outset of gameplay. I consider it to be one of the best Match-3 games that have ever been released. Mary Ann Takes the Cake!! Rated 5 out of 5 by Kittene from Challenging Game Played this game because I was bored with all the other games, Wow, what a fun game. Match 3, for sure yet there is so much to do and places to go and what a great adventure. Played the free hour, bought it one the spot when done and played it for 3 more hours. Still not done, there is a lot to do with this game, not just match 3, dragons, shipwrecks, pirates, battels, and I am still no where near the end and I hope it keeps going and going. Just fun and interesting and challenging! Rated 5 out of 5 by myyorkies1994 from I Absolutely LOVE this game! This game was presented this past weekend as a $2.99 special. While I've been trialing all of the M3 games, I had not yet gotten to this one. I always read the help/how to play section after setting my volumes. The help screens seemed endless and I was beginning to get confused as there was so much information being provided and so many varieties of games being covered, but I started game play and it all fell into place as each type of game was presented. By the end of the trial I was completely addicted and immediately purchased the game so I could continue playing. I always read the reviews on a game before trial, and I want to thank the many that provided some detail of game play - it really helped a lot to know that spears are more effective on monsters and cannons are more effective on ships. I'm pretty far into this game and am STILL learning as I go along. There is SO much variety offered that it's just not possible to become bored with it! Enjoy Matey! Arghhhhhhh! Rated 5 out of 5 by girlina from Yarr! This game be full 'o pirate treasure, me hearties! Ha! You'll be full of the cheesy pirate speak with this game too. This is really one of the most enjoyable match 3 games out there because there's so much variety and because the match 3 games themselves require a little strategy on your part. The graphics are fun and the audio is clever. Highly recommended. I've actually owned this game for a bit and still find myself playing it.